The Times Expedition E-Tide series watches are analog watches that give the time, temperature, High and Low tide readings and a built in compass. The band is a stainless steel, link type band with a fold over metal clasp. When I first opened the package and retrieved the E-Tide from the box I thought how big and heavy it looked. After I put it on, it wasn't quite as heavy as I thought and it wasn't very thick. I am used to wearing this size watch so the diameter didn't bother me as much as I thought it would; thinking it would be thicker. The watch came way too big for my wrist so the first thing I did was figure out how to take the links out. My first thought was that I would have to take it to a jeweler to do this but I noticed tiny screw heads and the end of each link. That gave me an indication that I could probably do it myself. I retrieved the instructions and found the section on taking out the links. This was a fairly easy task if you have patience, good eyes or glasses and two very small phillips head screwdrivers. There are tiny arrows on every other link that indicate that those are the links that can be removed. After about 10 minutes and reading the instructions, I had the watch band the size that I needed so it was a fairly easy task. I was really expecting a book for instructions but it came with a folded up piece of paper with simple instructions on how to set all the features of the watch, in English and several other languages. The right had side of the watch has three, push button setting knobs. The top one with the red ring is the temperature button. Simply press this button and the dedicated dial will rotate to the current temperature. This dedicated dial is used for the temperature reading, the tide reading and the compass reading. It is somewhat distinctive from the 'time' hands. One end is skinny and narrow with red color on the end indicating that portion of the dial is used to read the temperature since the red dial matches the red ringed button. The middle push button is used to set the time, date and compass calibration. To set the time this button is pulled out completely and rotated to set the desired time. To set the date this button is pulled out half way and rotated to set the desired date. This button is also used to calibrate the compass with a series of presses and rotations of the watch. 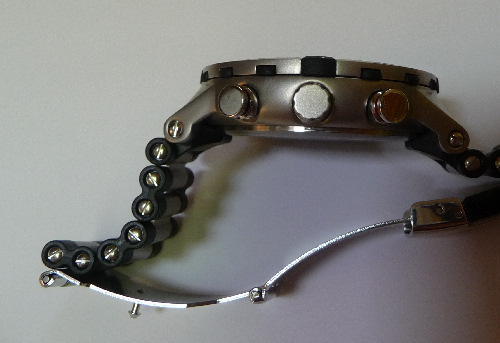 It also illuminates the face of the watch when pressed once. The face stays illuminated for approximately four seconds. The bottom button on the right side with the black ring is pressed to see the current tide. When this button is pressed the same dedicated dial that was mentioned earlier will rotate around to the number six position and then turn back the opposite way to wind up at the current reading of the tide. This shows that the hand is resetting from the temperature function to the tide function or vise versa. The left side of the watch only has one button and this is to initiate the compass feature. When this button is pressed the same dedicated dial will not rotate to reset, it immediately rotates to the current direction of north. To calibrate the compass, there are a few button presses along with rotating the watch a few times and and pressing the compass button. The instructions say this needs to be done when the watch has gone a certain distance from when it was originally calibrated. I am usually not fond of the metal link type bands because they tend to pinch my skin or pull the hair on my arm. But with the E-tide band, the links are round and smooth and it feels very comfortable on my arm. After wearing it around a bit I have not experienced the band pinching or pulling the hairs on my arm. One the that I have found is that it is difficult to notice the 'time' hands as opposed to the temperature/tide/compass hand. When glancing down to see the time it takes a few seconds to notice the 'time' hands. They are a whitish color because they are illuminated, and with the white face background, it's hard to distinguish them from the temperature/tide/compass hand. Hopefully after some time of getting used to it, I'll be able to notice the 'time' hands more. 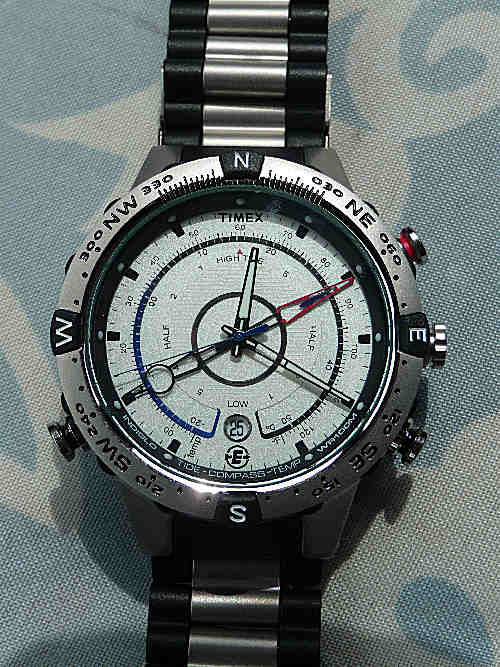 The Timex E-Tide has been an awesome watch to wear. I have worn it everyday since I received it and I have gotten many complements on it. It is very stylish to wear with everyday clothes but sporty and rugged enough to wear in the outdoors. Along with wearing it everyday I have worn it on a couple of day hikes as well. The hikes took place in the Pisgah National forest area. Temperatures were 75 F to 85 F (23 C to 29 C) and both times the weather was clear. 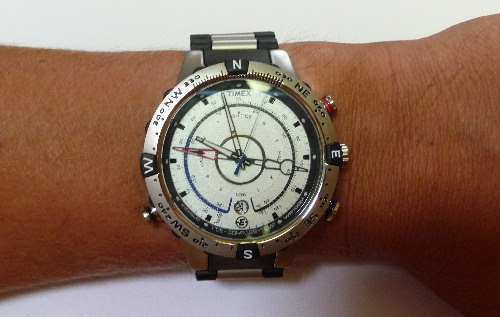 The functions of the watch such as the temperature and compass readings seem to be accurate. I used the temperature function several times during the day hikes while the watch was attached to my shoulder strap to get an accurate reading. I did not have any other method of checking the accuracy of it but it seemed to be pretty spot on with the local forecast and the feel of the air. The compass function seemed to be accurate as well. I took along a regular compass to check the accuracy with it and the readings were the same. The problem that I see with the compass function is that after a minute or so, the compass seems to stop its function and the button has to be pressed again for it to continue. This would be aggravating if one needed the compass to stay on, but for spot checking it would be okay. I plan to test the compass function a little more to get a better feel for its function. I have not been able to check the tide function as I do not live near the coast. However, I do plan to make a visit to the coast before this test series is over and I will check it then. The reading of the hands at first was a little difficult since they are the same color as the background. Also with the temperature, compass and tide hand being a bit bigger and more prominent than the time hands, the eye is drawn to see it more than the time hands. I have gotten used to this but there are times when in takes me a couple of seconds to focus on the time hands rather than the function hand. The illumination of the face has been awesome in the dark. It lights up very well and can be read very easily. The hands are illuminated as well even when the face light is not on but the time can be read easier when the face is illuminated. The fit has been great. I have not noticed the weight of the watch as I've worn it around. I was afraid that the links would pull the hairs on my arm, as this type of band normally does, but the band has not pulled one hair, it has been very comfortable to wear. I have noticed that it is looser in the mornings but as the day goes on, my wrist swells a bit and it fits perfectly. Overall, I have been very pleased with the watch. It is fun to wear and again, I get many compliments on it. I plan to continue to test the functions of the watch and to test the tide function as well. * Can't read the time hands at a quick glance, not as prominent as the function hand, should be the other way around. Thank you Timex and BackpackGearTest.org for this opportunity.